Name Variation Pearl Arlene Mickelson was also known as Arlene. Married Name 13 January 1945 As of 13 January 1945,her married name was Richards. Pearl Arlene Mickelson was born on 9 December 1924 at Wisconsin. She was the daughter of Albert E. Mickelson and Tillie Odness. Pearl Arlene Mickelson married Donald L. Richards, son of George J. Richards and Mae Michels, on 13 January 1945. Pearl Arlene Mickelson died on 30 May 2015 at age 90 Pearl “Arlene” (Mickelson) Richards, age 90, of Spring Green, passed away peacefully on May 30, 2015 surrounded by her family. She was born on December 9, 1924 in Arena Township, and was the 13th of 15 children of Albert and Tillie (Odness) Mickelson. She married Donald Richards on January 13, 1945. Donald and Arlene then began farming together. She participated in all aspects of running the farm while raising seven children. Upon leaving the farm, Arlene worked 11 years for Pig Improvement Company (PIC). After retirement, she worked part-time for The Prairie House Motel until celebrating her 80th birthday. Arlene was proud of her large family and enjoyed their many gatherings which most often included musical entertainment provided by talented relatives and friends. Arlene was a hardworking, devoted wife, mother, and grandmother. She also enjoyed gardening, tending to her flowers, and many great family fishing trips. Arlene is survived by 5 children, Lavern (Jean) Richards, Betty (Ken) Koenig, Bonnie (Ronald) Fingerhut, John Richards, and Roger (Denise Cottone) Richards; and daughter-in-law, Sharon Richards; 10 grandchildren, 3 step-grandchildren, and 8 great-grandchildren. She is further survived by her sister, Sally Milne, of Mesa, AZ; sister-in-law, Geraldine Mickelson, Horseshoe Bend, AR; and many other relatives and friends. She was preceded in death by her husband, Donald; sons, Bill and Dale; grandson, Jayson; step-grandchild, Bryan Eichorst; parents; 9 brothers, Clarence, Olvin, John, Gilman, Marvin, Milo, Tommy, Elmer, and Lawrence; 4 sisters, Alma Johnson, Melva Hottman, Albertha Sharer, and Doris Gladem. Funeral services will be held at Christ Lutheran Church, 237 E. Daly St., Spring Green at 11 a.m. on Friday, June 5, 2015. Rev. Douglas Larson-Sell will officiate with burial in the Spring Green Cemetery. Visitation will be held on Friday at the church from 9 a.m. until time of service. In lieu of flowers, memorials may be made to Christ Lutheran Church or charity of your choice. The Richardson-Stafford Funeral Home in Spring Green is assisting the family with the arrangements. Donald L. Richards was born on 15 July 1917 at Wyoming, Iowa, Wisconsin. He was the son of George J. Richards and Mae Michels. Donald L. Richards married Pearl Arlene Mickelson, daughter of Albert E. Mickelson and Tillie Odness, on 13 January 1945. Donald L. Richards died on 28 April 2002 at age 84 Donald L. Richards, age 84, of Spring Green passed away on Sunday, April 28, 2002 at Sauk Prairie Memorial Hospital, with his loving family by his side. He was born on July 15, 1917 in Wyoming Valley, the son of George and Mae (Michels) Richards. He married Arlene Mickelson on Jan 13, 1945. Donald and Arlene farmed in Big Hollow until 1975. Donald then worked for Peck's Feed and Grain until he retired in 1984 due to poor health. He was a talented woodworker and spent countless hours in his workshop making various toys, windmills and chests. Donald enjoyed driving around the countryside and spotting windmills he had made. He especially loved sharing and entertaining his family with many stories of his life and experiences. He will long be remembered for his subtle humor, strong sense of integrity and quiet gentleness. Donald was a loving husband to his wife of 57 years, Arlene, and caring father, grandfather and great-grandfather to his children and grandchildren. Along with his wife, he is survived by three sons, Lavern (Jean) and Roger (Pat), both of Spring Green, and John of Madison; two daughters, Betty (Ken) Koenig of DeForest, and Bonnie (Ron) Fingerhut of Spring Green; daughter-in-law, Sharon of Lone Rock; 10 grandchildren, three step-grandchildren and two great grandchildren. Donald is further survived by a brother, Lyle of Austell, GA; and three sisters, Norma (Lucius) Davidson of DeForest, Lois (Jack) Swaziek of Muscoda, and Mary Lou (George) McCabe of Elkhorn. In addition to his parents, he was preceded in death by two sons, Bill (Sharon) and Dale; grandson, Jayson; step-grandson, Bryan Eichorst; brother, Wilbur (Maybelle); and three sisters, Stella (Tony) Bauer, Elizabeth Coyne and Berniece (Max) Stueber. Funeral services will be held at 1 p.m. on Thursday, May 2, 2002, at Christ Lutheran Church, 237 E. Daley St., Spring Green. Relatives and friends may call from 11 a.m. until the time of the service at the church. Bill Richards was the son of Donald L. Richards and Pearl Arlene Mickelson. Bill Richards died before 2015. Dale Richards was the son of Donald L. Richards and Pearl Arlene Mickelson. Dale Richards died before 2015. Clarence Mickelson was the son of Albert E. Mickelson and Tillie Odness. Clarence Mickelson died before 2015. Olvin Mickelson was the son of Albert E. Mickelson and Tillie Odness. Olvin Mickelson died before 2015. John Mickelson was the son of Albert E. Mickelson and Tillie Odness. John Mickelson died before 2015. Gilman Mickelson was the son of Albert E. Mickelson and Tillie Odness. Gilman Mickelson died before 2015. Marvin Mickelson was the son of Albert E. Mickelson and Tillie Odness. Marvin Mickelson died before 2015. Milo Mickelson was the son of Albert E. Mickelson and Tillie Odness. Milo Mickelson died before 2015. Tommy Mickelson was the son of Albert E. Mickelson and Tillie Odness. Tommy Mickelson died before 2015. Elmer Mickelson was the son of Albert E. Mickelson and Tillie Odness. Elmer Mickelson died before 2015. Lawrence Mickelson was the son of Albert E. Mickelson and Tillie Odness. Lawrence Mickelson died before 2015. Married Name Her married name was Hottman. Melva Mickelson was the daughter of Albert E. Mickelson and Tillie Odness. Melva Mickelson married (?) Hottman. Melva Mickelson died before 2015. (?) Hottman married Melva Mickelson, daughter of Albert E. Mickelson and Tillie Odness. Married Name Her married name was Sharer. Albertha Mickelson was the daughter of Albert E. Mickelson and Tillie Odness. Albertha Mickelson married (?) Sharer. Albertha Mickelson died before 2015. (?) Sharer married Albertha Mickelson, daughter of Albert E. Mickelson and Tillie Odness. Married Name Her married name was Gladem. Doris Mickelson was the daughter of Albert E. Mickelson and Tillie Odness. Doris Mickelson married (?) Gladem. Doris Mickelson died before 2015. (?) Gladem married Doris Mickelson, daughter of Albert E. Mickelson and Tillie Odness. Married Name 28 April 1962 As of 28 April 1962,her married name was Alt. Alice E. Brei was born on 5 October 1943 at Wisconisn. She was the daughter of Frank E. Brei and Frieda I. Nachreiner. Alice E. Brei died on 5 September 2015 at age 71 Alice E. Alt age 71 of Spring Green passed away on Saturday, September 5, 2015 at St. Mary’s Hospital in Madison. She was born on October 5, 1943 in Franklin Township the daughter of Frank and Frieda (Nachreiner) Brei. Alice was married to David Alt on April 28, 1962. She was a member of St. Luke’s Catholic Church in Plain. Alice enjoyed farming along side of her husband her entire life. She enjoyed cooking, quilting, nurturing baby animals in need, her gardens especially her flowers, and most of all spending time with her kids and grandkids. Alice’s family and friends meant everything to her and she meant everything to them. She will hold a special place in all of our hearts.Survivors include her husband, David Alt of Spring Green, 5 children, Greg (Tami) Alt of Plain, Jackie (John) Jewell of Plain, Mark (Lori) Alt of Spring Green, Tim Alt of Spring Green, Shelly (Tim) Herritz of Reedsburg, 8 grandchildren, Tori (Andrew) Nachreiner, Travis, Nathan and Nicole Alt, Jared and Jerica Jewell, Caleb Alt and Davan Herritz, 2 sisters, Roseann (Tom) Otter of Waunakee, Bonnie Brei of Plain, nieces, nephews, other relatives and friends. She was preceded in death by her parents, Frank and Frieda Brei, 2 brothers, Frank and John Brei. A Mass of Christian Burial will be held on Friday, September 11, 2015 at 11:00 A.M. at St. Luke’s Catholic Church in Plain. Fr. Mike Resop will officiate with burial in the church cemetery. Visitation will be held on Thursday, September 10, 2015 at St. Luke’s Catholic Church from 5:00 P.M.-8:00 P.M. and again on Friday from 10:00 A.M. until the time of Mass at 11:00 A.M. The family would like to thank the St Mary’s Medical staff for all their loving care. Online condolences available at www.staffordfuneralhomes.com. The Richardson-Stafford Funeral Home is assisting the family with the arrangements. Bonnie J. Brei was born on 7 January 1953. Bonnie J. Brei died on 19 May 2016 at age 63 Bonnie J. Brei age 63 of Plain passed away on Thursday, May 19, 2016 at the Greenway Manor Nursing Home in Spring Green due to complications following chemotherapy for plasma cell leukemia. She was born on January 7, 1953 to Frank and Frieda (Nachreiner) Brei. Bonnie attended St. Luke Grade School and graduated from River Valley High School. She lived her entire life on the family farm in Franklin Township. In her own quiet way, Bonnie brought joy and beauty to those close to her. Her creativity was evident in her sewing, quilting and cake decorating. She grew beautiful flowers and vegetables and always had a ready supply of cookies and bars for visitors. Bonnie was currently employed at Greenway Manor Nursing Home and sewed parachutes for Top Flight Recovery LLC. She also sewed christening gowns for St. Luke’s Parish where she was a member. Survivors include her sister, Roseann (Tom) Otter of Waunakee, a brother-in-law, David Alt of Spring Green, a sister-in-law, Paula Brei of Baraboo, an aunt, Evelyn Nachreiner of Loganville, many nieces, nephews, cousins and good friends. Bonnie was preceded in death by her parents, Frank and Frieda Brei, 2 brothers, Frankie and John Brei and a sister, Alice Alt. A Mass of Christian Burial will be held on Wednesday, May 25, 2016 at 11:00 A.M. at St. Luke’s Catholic Church in Plain. Fr. Mike Resop will officiate with burial in the church cemetery. Visitation will be held on Tuesday, May 24, 2016 at St. Luke’s Catholic Church from 5:00 P.M.-7:00 P.M. and again on Wednesday at the church from 10:00 A.M. until the time of Mass. The Richardson-Stafford Funeral Home is assisting the family with the arrangements. John Brei was the son of Frank E. Brei and Frieda I. Nachreiner. John Brei died before 2015. Married Name 2 January 1956 As of 2 January 1956,her married name was Nachreiner. Helen Keller was born on 21 September 1925. She married Louis Nachreiner, son of Ernest Nachreiner and Mary Ruland, on 2 January 1956. Helen Keller died on 11 June 2017 at age 91 Helen R. Nachreiner age 81 of Plain passed away unexpectedly on Sunday, June 11, 2017 at her residence. She was born on September 21, 1935 the daughter of Clarence and Veronica (Limekueller) Keller. She was married to Louis “Louie” Nachreiner on January 2, 1956. They had 2 children, Tim and Stephanie. Helen is survived by her son, Tim Nachreiner. She was preceded in death by her parents, Clarence and Veronica Keller, her daughter, Stephanie and her husband Louie. Per Helen’s wishes there will be no service held. Stephanie Nachreiner was the daughter of Louis Nachreiner and Helen Keller. Stephanie Nachreiner died before 2015. Todd James Blau was the son of James E. Blau. Todd James Blau died before 2009. Christ Ganser married Genevieve Uslemann. Name Variation Genevieve Uslemann was also known as Uselman. Married Name Her married name was Ganser. Genevieve Uslemann married Christ Ganser. Married Name Her married name was Frey. Irene Ganser was the daughter of Christ Ganser and Genevieve Uslemann. Irene Ganser married Howard Frey. Howard Frey married Irene Ganser, daughter of Christ Ganser and Genevieve Uslemann. 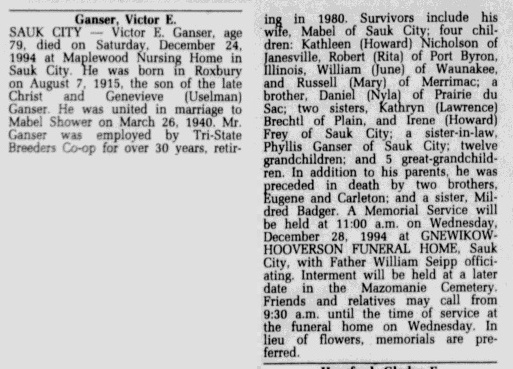 Victor E. Ganser was born on 7 August 1915 at Wisconsin. He was the son of Christ Ganser and Genevieve Uslemann. 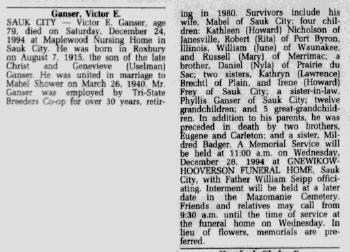 Victor E. Ganser married Mabel Shower on 26 March 1940. Victor E. Ganser died on 24 December 1994 at Sauk, Wisconsin, at age 79 Victor E Ganser obituary.